I finally had an available Saturday that coincided with a guild meeting of the Modern Quilt Guild in Chattanooga. So, I decided to go. The meeting was well attended and the program was on free-form piecing. The program was a hands-on exercise with the goal of providing new quilters—or quilters new to free-form piecing—with an opportunity to experiment with this technique; a popular patchwork technique that is found in many of the modern style quilts. Fabric scraps of various sizes were sorted into bags for free-form piecing. 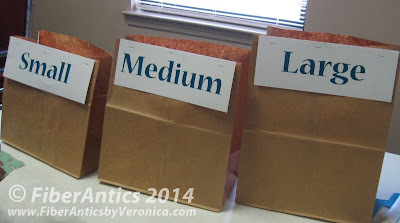 Various fabric scraps were sorted and put into brown bags according to their relative size. Apparently, the guild members had been collecting scraps over the last several months with this exercise in mind because there were four work areas set up in the room. Through a blind draw, scraps from the "small," then "medium," and if necessary, the "large" bag were assembled with no forethought or angst over choosing a layout or pattern. The randomly chosen scraps were sewn together intuitively to form patchwork (note, I didn't use the word "block"). These are a few of the pieces that came from the group I was with. 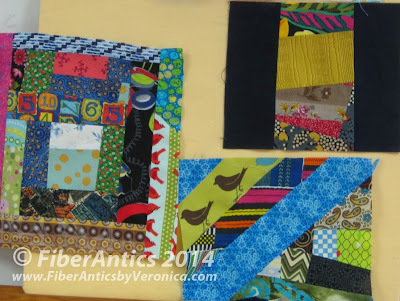 These pieces are much like the "crumbs" patchwork that I referenced in this blog post. It's all about using random bits and pieces of fabric and sewing them together without a specific plan, with no heed to coordinating fabrics, styles, colors or prints, and just letting the bits fall where they may. Free-form! Gwen Marston calls this technique "liberated quiltmaking" in her books of the same name. Whatever you call it, it's easy sewing and fun patchwork. I am a full-time quilter, maker, instructor, fabric strategist and fabric sales rep. I converse and share ideas with others who enjoy fabric, stitch, color and pattern—through my client sales support and classes. My career in printing, typography and the graphic arts often finds its way into my quilts and classes because I believe that the work is about visual communication—whether ink on paper, pixels on screen, or stitches on textiles. Every quilt and each maker has a story to tell. Let's get together. Tell me your story. Have you done the Wide Back Math? Click here on how to save some money. I'm published in "The Improv Handbook"
Follow the July Blog Hop for Improv Handbook quilt testers. Two of my garments are featured in Belle Armoire Summer 2011.